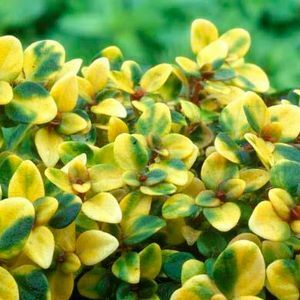 A low spreading, evergreen thyme which has golden variegated foliage, colorful flowers & a great lemon scent. Blooms are clusters 3”-4” with tiny pinkish purple flowers. Leaves are very bright in the cool of spring. Plants 4-5”. Excellent for edging, rock gardens & around and between stepping stones.